A review of national trends and best practices informs this analysis of key factors for high-impact teacher education programs abroad, particularly short-term faculty-led programs. Challenges faced by such programs, as well as criticisms of short-term study abroad are addressed and strategies proposed for fostering successful faculty-led programs including discussion of concerns regarding sustainability, curriculum integration, partnerships, student engagement, career integration, and safety and security. 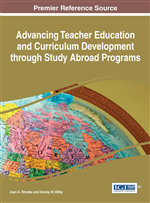 Despite an 87% increase in the overall number of U.S. study abroad participants since 2000-2001, the percentage of preservice teachers represented in the overall number of U.S. study abroad students has neither increased nor decreased, but rather remained a steady 4% since that time (“Open doors data,” 2014). Possible explanations of why teacher education students do not study abroad as often as their counterparts include challenges previously mentioned such as rigid sequencing in the teacher education curriculum and restrictions due to state licensing requirements. A lack of viable study abroad program options for preservice teachers is another likely explanation. Some existing program models, such as exchanges and third-party study abroad programs, present specific challenges to students in teacher education that limit their potential for enrollment and participation.